This week we are practically over run by the living dead. More than forty miniatures were painted this week in response to my call for a speed painting effort. That’s an outstanding turnout, and when you consider that each of these minis averaged less than 30 minutes a pop, I think that the quality is outstanding. Nothing new to report on the Kickstarter front this week, though rumor is that Dust Tactics will be launching a big project in the next few weeks. I had a lot of fun painting this week’s challenge, though I ran out of time for a proper picture before my bedtime turned me into a pumpkin. I also would have liked to do one more highlight layer. I think the biggest thing I learned this week was how fast you can go when you stick almost exclusively to a size 3 brush. I really like Kylie’s rust and decay. I think she did a much better job than me when it comes to making it look natural. Even with serious time constraints Dirk continues to be a real show off. Just look at all that lovely freehand work – bravo. Antonia takes the prize this week for the most amount of color variety. Really fantastic stuff. Magnus skeletons came out the most crisp. Surely these came from medical cadevers, and not from shallow graves like the rest of the line up. I love how Arjen laid out this picture, showing all the different things they tried and the time it took to do them. It really gives some great perspective. So let me ask everyone these two discussion questions: how long did the average mini take this week, and did you learn that you think will speed you up on future efforts? Terrain – We’ve been showing off lots of miniatures these last few months, but you need some terrain too play with them. Show us all what you’re working on. – Send pictures to caffeineforge@gmail.com by 5/25/14 at 9pm. Oh Rats! 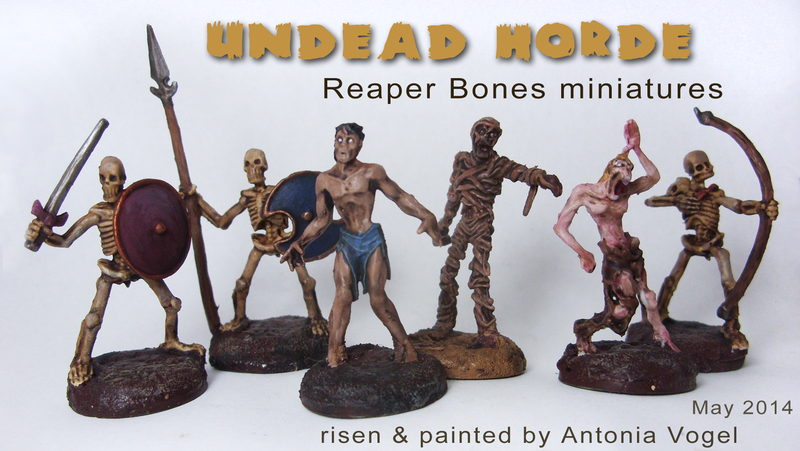 – Let’s knock out another group of minor minis! You guys did a great job with the rust effects! 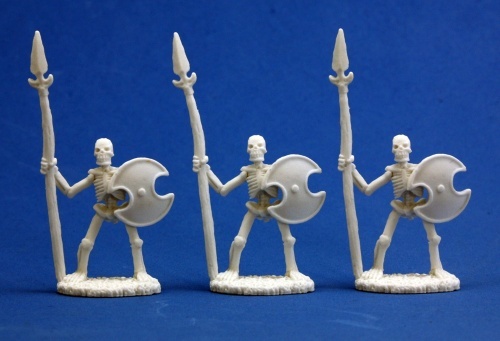 My skeletons have a little bit of rust, but it doesn’t show up well in my picture. It’s something that I need more practice with. I can’t say how long the figures took; I was doing too many other things this weekend, and had to work in segments. There was less “learning” than there was actual practice of speed painting techniques for me. Did you try using any washes or anything to dirty them up? Everyone did such a great job! Thanks for the compliments on my rust – it was a first attempt for me and I am really proud of it! I did mine in groups so I painted the 4 zombies first, then 3 skellys and the next 3 skellys. Zombies – these took the longest at about 3 – 3.5 hours. It didnt help that when gluing one to the base I managed to superglue it to my finger and then pull some paint off when I removed my finger – thus I had to retouch one of the minis. 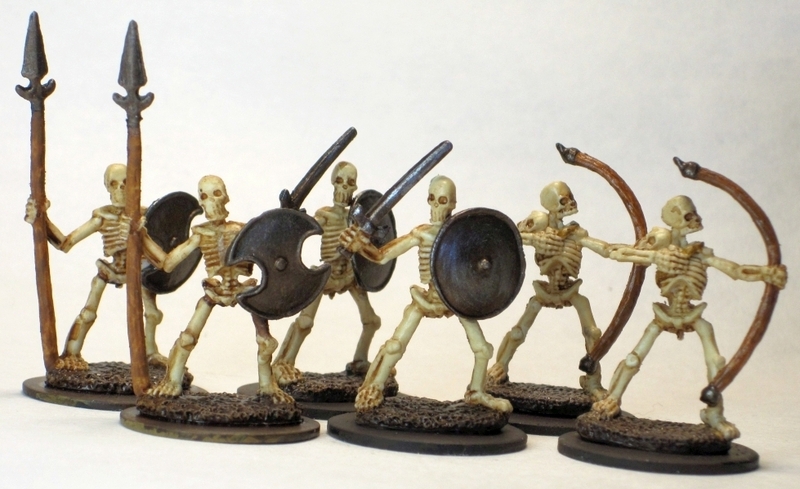 Skelly group 1 – Took me about 2.5 hours, I had never painted rust before and the experimenting took some time. Skelly group 2 – These took under 2 hours. I had figured out how I wanted to do rust and knew the finish I was doing on my skellys. I think it would have taken less time if I hadnt have both the archers in this groups as they had a few more details than the others. I believe doing them in batches helped me go faster, however I think that also made me lose a little quality in painting. But I think the trade off is worth it on models that are used as “trash” (peons) in our pathfinder games. Do you think you learned any tricks that will help you on more detailed projects? Not as much but some small things… I think Dirk is right – knowing your colours before hand and planning out definitely makes things go faster. I also think if I want to get a big project done in a time limit then I need to stick to techniques I already know. 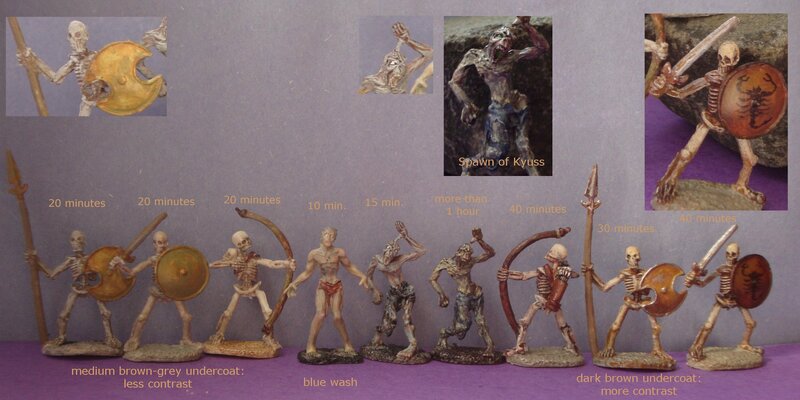 a very nice collection of undead! 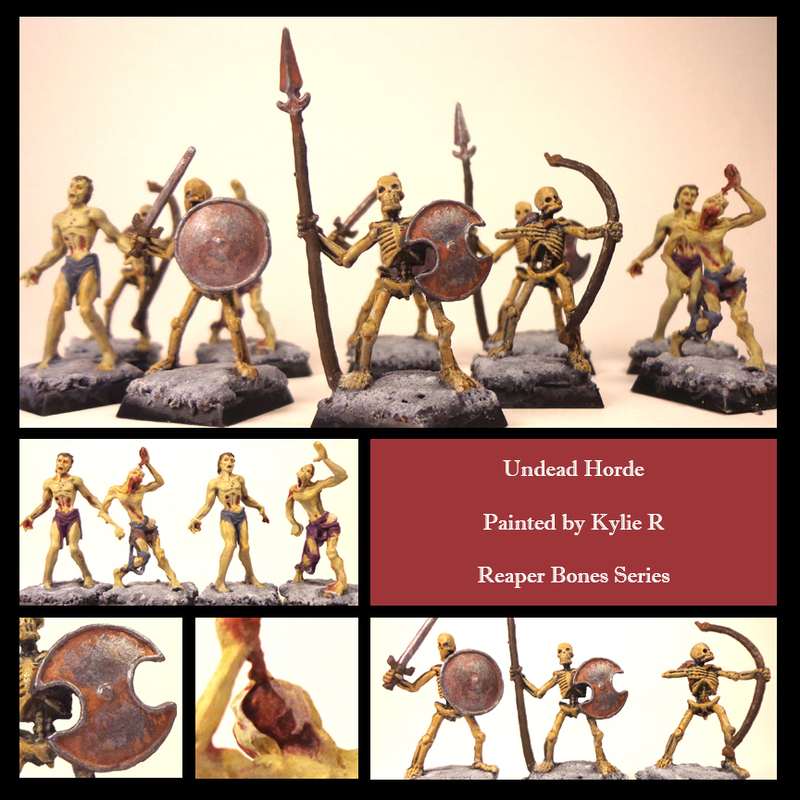 I especially like the rust effect by Kylie and the freehand scorpion by Arjen. Great job! 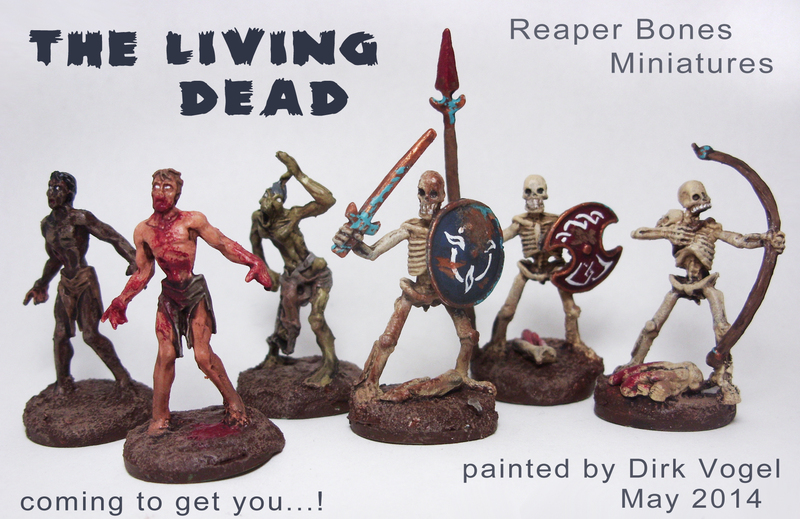 Me and my wife set us a time limit of approximately 3 hours (two DVDs: Galaxy Quest and – surprise – Night of the Living Dead) to paint the minis we devided between us. I was a bit faster, so I had the privilege to paint the Ghast as a bonus. But I got only to basecolour in the remaining time (by the way – @Magnus: really nice “Beastmen”). The painting went really quick as I decided beforehand which colours to use. The freehand shield design was surprisingly easy – just white paint and a steady hand. The one was an Earthdawn symbol,. the other wasn´t planned before, I just wanted some “knot work” and painted intuitively, in the end I liked it more than the first one. @David: looking forward to painting the Rats! We have an extra batch of them so we both can go to painting frenzy. Earthdawn: one of the greatest but most underutilized worlds ever. I love that game. @Dirk. Originally I had a rohirrim-like symbol – white on green- in mind for my shield, much like your knot work, but I was afraid it would look too crisp and new. I like how you aged your shields, especially the blue one. As I thought I could not pull that off, I looked up ancient bronze shield designs on google images and chose the scorpion, as it is generic enough for all kind of settings and works well using brown on rust-brown, which gives less contrast (and thus makes it look less crisp). @David – Since I am not working on any terrain at the moment I decided to use this week to paint some of the decor items. However I wasn’t sure if I should send in pictures since they aren’t really terrain.